The biggest and brightest holiday light display in New England! New England’s biggest and brightest light display, with over 650,000 lights! Gardens Aglow is an outdoor walking event – please dress appropriately for Maine’s seasonal weather. 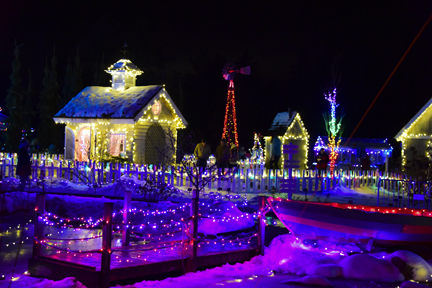 Gardens Aglow is a signature event during Boothbay Lights. Come to the Boothbay Region before your scheduled Gardens Aglow visit after spending the day shopping and dining then take our complimentary shuttle directly to CMBG for Gardens Aglow. Specific dates are yet to be confirmed. More info coming soon!